Hi lovelies! Another recipe post for you all today, as I've been loving doing healthy recipes and experimenting a little more with food, rather than going with easy options all the time! I'm afraid we're all just going to have to bare with me on this, as I'm not an expert cook, I've not done recipe posts before and there will be absolutely no precise measurements in these recipes whatsoever. That's kind of what I like about them, they're super simple, fairly fuss free and super healthy. Many of you will know that health and fitness is very important to me, however what you may not know, is that I don't love cooking, I've never been too adventurous with cooking and generally have just taken the easy option, but for the new year, I decided that was going to change and as I said, I'm going to start experimenting in the kitchen! So, in this post I wanted to share three recipes using one of my all time favourite ingredients, sweet potato! This recipe is so much easier than I thought. I absolutely love fishcakes, but it's shocking how many nasties can be in some of the frozen supermarket versions. So, I decided to give my own a try. To make four of these, I peeled, chopped and boiled two small sweet potatoes. I then mashed it with a potato masher, then added a tin of tuna and one slice of brown bread made into breadcrumbs (using a blender), just to help the cakes stick together a bit better and then added finely chopped kale and mixed that in with a wooden spoon. I then shaped them with my hands and grilled them for roughly 15-20 minutes until they were crispy on the outside and that was it! I served these with courgetti, made with a julienne peeler then boiled for 3 minutes in veg stock and kale tossed in sweet chilli sauce, then baked for 5 minutes until crispy. This was super yummy and filling too. The tuna in these could be substituted for any type of cooked fish and are also really nice served inside a granary roll too. Another very easy recipe, this healthy alternative to oven fries, or fast food is super tasty and surprisingly easy to do. For the fries, I chopped one large sweet potato into the shape of fries, then boiled them until they were slightly soft, then popped them on a wire rack, on top of a baking tray (this ensures both sides of the fries will get crispy without the need for turning halfway through, anyone else rubbish at remembering this?! ), I lightly brushed the boiled fries with oil and sprinkled them with paprika before baking them in the oven for around 20-30 minutes on about 200 degrees. It's worth keeping an eye on these while they cook, as the cooking time isn't always consistent. For the stir fried chicken, I simply cut up two chicken breasts (this meal was for two!) into small chunks, then pan fried it in a little oil with garlic, paprika and hot chilli powder. I then tossed some peas and green beans into the pan, so they'd pick up a little flavour from the chicken, then served! This combo is super yummy and depending on how many veggies you throw in, you can easily get two or three (or more!) of your five a day in this type of meal. If you're a veggie, or simply don't want to eat meat or fish every day, this recipe will be perfect for you! To make four good sized burgers, I chopped, boiled and mashed two medium sweet potatoes, then stirred in one strained can of mixed beans. I also stirred in one slice of bread made into breadcrumbs and some finely chopped kale, though these are optional. The breadcrumbs do help stop the burgers falling apart though, as any liquid from the beans can make them a little unstable!! You can use any type of beans for these, I personally like the cans of mixed beans from the supermarket, as they're cooked and ready to use. You'll want to mash the beans in as it makes for a better texture to the burgers. To cook, I shaped these then grilled them for about 25 minutes. The cooking time can be longer or shorter depending on how thick you make the burgers. 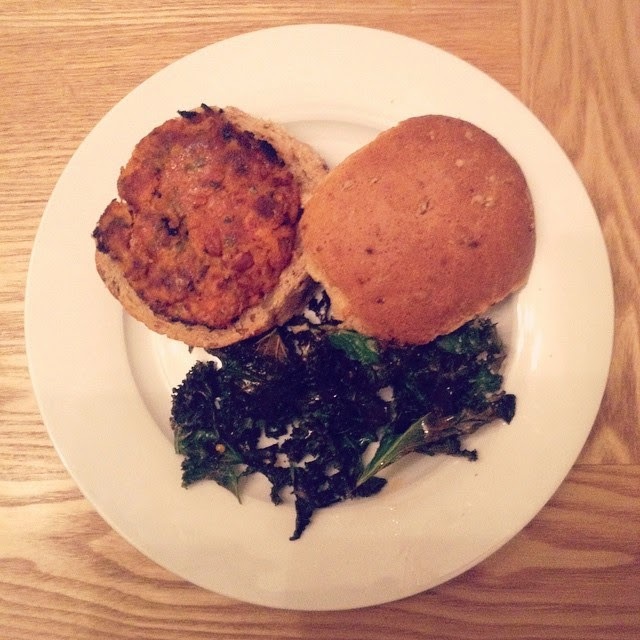 I served this on a granary roll and again, with crispy kale, baked in the oven, however you could substitute for a side salad or a big pile of veggies for a super filling meal. So, that's it! 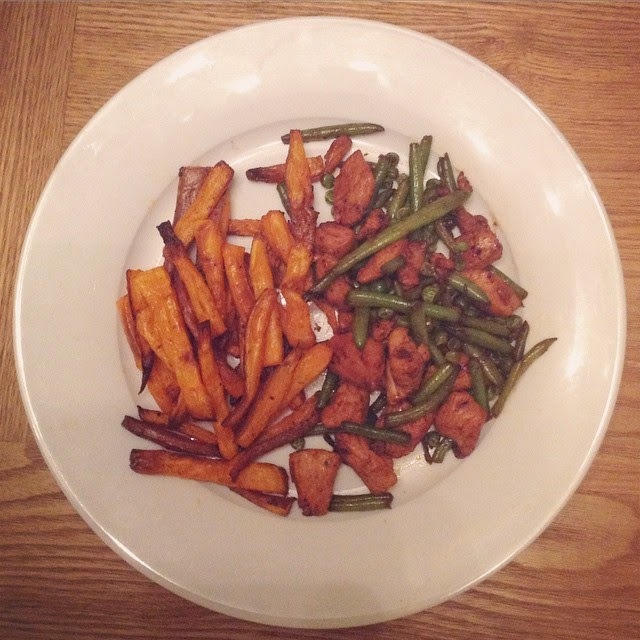 Sweet Potato three, super simple, healthy ways. What do you think? Will you be trying any of these recipes? 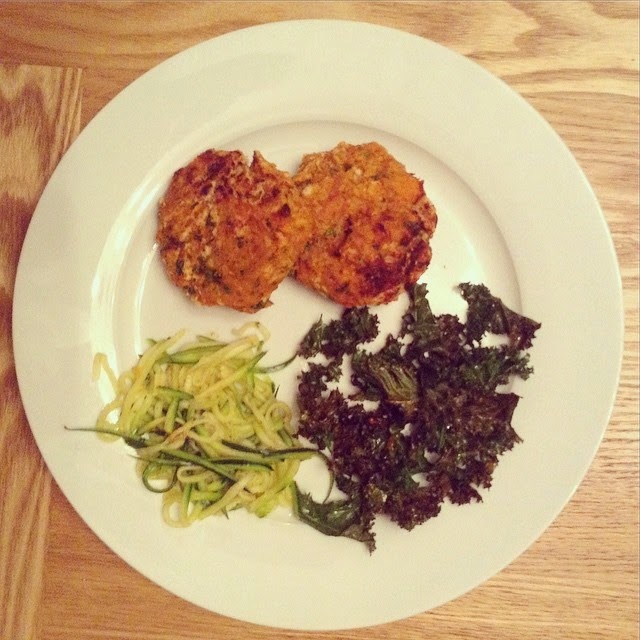 I love bean burgers, adding sweet potato is a fab idea!